The following document provides an overview of the information available on the Delegated Administration screen within the Wisc Account Administration site. What does the Delegated Administration screen look like? Below is a screenshot of the Delegated Administration interface. What should I do if I don't see my account, service account, resource, or domain listed? If you should have administrative access to an Office 365 service account or resource calendar, contact your domain administrator. If you aren't sure who the administrator is, contact the DoIT Help Desk. 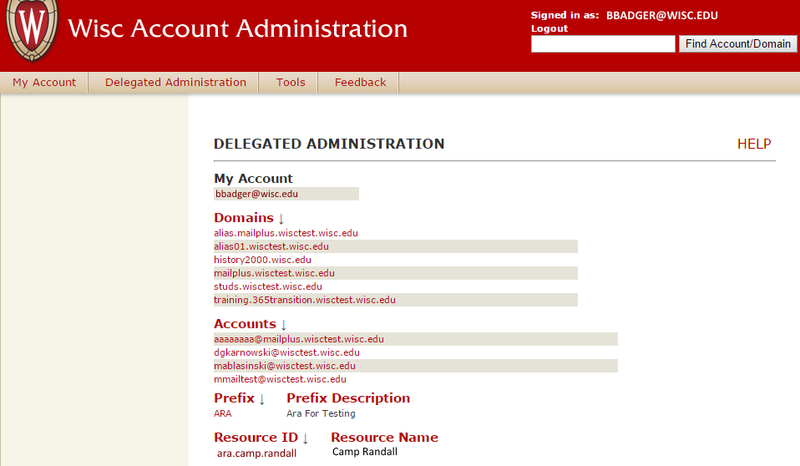 If you should have administrative access to another netid@wisc.edu account, please review Administer NetID Accounts document. If you should have administrative access to a Office 365 domain, please contact another administrator of your domain or email wmplusadmins@doit.wisc.edu.